Business all over the world are constantly looking for ways to promote their product and increase sales. The internet, especially social media platforms offers a brilliant opportunity like Facebook Ads to get in touch with current and potential customers. Facebook, as the biggest social media platform with over one billion users, offer the largest audience all over the web. If Facebook was a nation it would rank third in the world’s population after China and just behind India. When Facebook is used smartly it is “not an evil time-waster, a community just for younger generations, nor is it irrelevant for marketers even B2B folks.” It is more that, Facebook is very useful to interact with people and work on your network. Social media is about establishing and building relationships, whether they are personal or business connections. In many cases, you may find that some connections will blur the lines between the personal and business realms. It is also important to be transparent and authentic when using social media to market a business. People like to connect with people, not faceless brands. Furthermore, these personal connections will lead to business ventures and referrals through the electronic word of mouth marketing for your company. On Facebook, Profiles are meant for people, and Pages are meant for businesses. To fully engage and leverage Facebook’s features, you should create a personal profile then setup your Facebook Page which has a built-in significant functionality specifically for businesses. There are a few key differences between Business Pages and Personal Profiles: Pages allow you to designate multiple administrators so you can have more than one person help manage the account. In addition, if one of your administrators leaves the company, you can still have control over the Page. Pages are, by default, public, and are starting to rank in Facebook and public search results. Pages are split into different categories (local businesses, brands, musicians) that help you get listed in more relevant search results. Personal profiles have friends, which require mutual acceptance, whereas anyone can become a fan of your Page without needing administrator approval. Facebook Ads allow you to do marketing for your business, acquire fans for your business Page, and create more leads. It makes possible for you to advertise a page or content you are managing on Facebook (like a Group, Page, or Event). The ad design and management tools are almost the same as the Google AdWords interface. The next step is to pick your targeting options. Your ad is more inclined to do well and continue running successfully if it’s being displayed to users who are the most likely to be interested in your product or service. It is possible to target people by likes/interests, and connections on Facebook because its system has built-in analytics to help track ad performance in terms of number of impressions, clicks, and click-through rate. You can run multiple ad variations simultaneously and use the Ads Manager to identify which terms or topics deliver the best results for your business. What makes marketing on Facebook very attractive for companies is that the ads can be targeted very specifically to your client’s profile. That’s fundamental for a successful Facebook Ads Marketing campaign - to be aware of the demographics of your ideal client. What differs between Facebook Ads and Google AdWords is that you cannot buy certain keywords. You have to anticipate, which interests and activities on Facebook predict certain behaviours, such as purchasing your product, or being at least a potential customer. How Effective Social Media Marketing Really Is! So far we have learned that social media can increase your sales significantly. Ryan Smolkin, for example, used social media to build his brand of business. As founder of Smoke’s Poutinerie, Ryan established a growing chain of restaurants that sell poutine (the most popular Canadian favourite containing French Fries, cheese curds and gravy). His Facebook and Twitter feeds reveal his way to success. His posts are about events around his restaurants, opening times, new restaurant opening up. They are generally kept joyful and tend to contain a little banter. He has managed to be so successful, that his customers, fans and followers constantly talk about the experience they had at his restaurant and his regular engagement with them. It’s an ongoing marketing campaign for his business and reveals the power of social proof. Smolkin does have to give the campaign a direction any longer it is running itself. 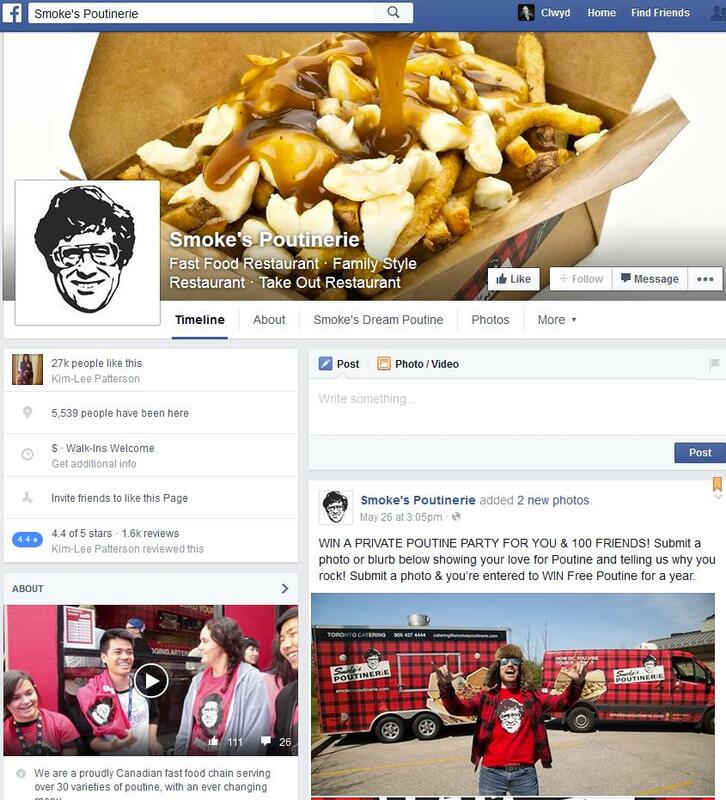 Shown here is Smoke’s Poutinerie Facebook Page. It is kept simple, on spot and makes you eager to interact with the brand. The take home message is that he decided to post and share regularly on social media even though, it was not clearly visible that a big part of his success was due to his social media engagement. There were no numbers on that. Generally he cares about his content and focuses on sharing information that he knew it’s important to his customers and community. The content you share has to be relevant to your community and customers. It is crucial to give your social media accounts a lot of attention. Treat your community well. It will pay off. As we have seen, the strategy has to suit your customers. It will work if you do it right but if it doesn’t work, you will have to change your strategy. While it does take a bit of time, effort and budget there is no doubt Facebook is effective and should be at or near the top of your company’s digital marketing plan. For using Facebook in a successful manner, like any other system you first have to understand how it works. A system called EdgeRank is used by Facebook determine where and how your post shows up in a user’s news feed. Design your content in a way that aligns with the EdgeRank criteria, by doing so can be assured that it will reach as many people as possible. posting relevant content to your audience. Essentially, the more engagements your post get the longer they stay in the news feed. Producing good content is the absolute key. It is the single most important part of your social media campaign. No one is inclined to engage with your content and your brand if you provide poor quality content. It has to be relevant, interesting and that it doesn’t harm if it has a surprising touch to it, something unexpected. It is important that you post content that is related to your industry and/or company most of the times. Many people are still hung up on the idea that the internet is all about cats and puppies. As long as your business is not in the pet food industry or related to pets, in any sense, you shouldn’t post something about pet foods! It is not relevant to your target group and thus, approaches like that are very short-lived. You can always post content displaying the member of your company or any activity your company is involved in. That will show how dynamic your company is! This photo shows the Whitehat owner Clwyd Probert attending the UCL business coaching group in London. 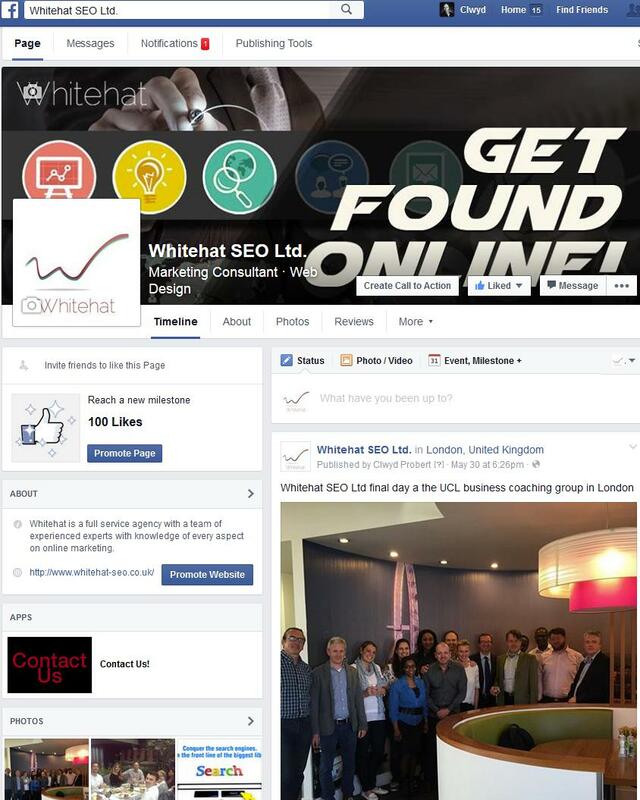 For more information regarding Whitehat and its Facebook page click here. As we all know in marketing, it is crucial to be innovative and ever-changing. When people get used to something, they lose focus. You will have to alter your strategy from time to time to the same accounts for Facebook. These tip will get your social media game to the next level and are easily implemented in your daily social media routine. Recently Facebook has changed the way the News Feed operates. These new rules will alter the game especially for brands and the way they can do marketing campaigns on Facebook. The alterations can have an impact on Facebook marketing agenda for your business. In order to get the most out of your Facebook marketing we have gathered the most common questions regarding the changes in 2015. What are the modifications in the News Feed in 2015? A recent post on Facebook’s official blog has announced that, Facebook has started to minimise the number of overly promotional page posts in users’ News Feeds. This also means that innate distribution will become less, so if you want to advertise your services and products, your business will have to go the way of Facebook for Business: Facebook Advertising. If Facebook Pages are a crucial component of your businesses’ Facebook agenda, this change means that you will need to use Facebook ads to achieve the same engagement on organic posts that promote your products and services. How do these changes effect small businesses that don’t have the budget to spend on Facebook marketing? Here are some practical tips to help you enhance your Facebook marketing if don’t have a budget to use on it. Assess your Facebook advertising strategy and design content that will be seen on Facebook. Use the proper link format when posting links on your Social Media account rather than burying links in photo captions. Definitely, perform a Facebook posting test to figure out what type of posts gets the most engagement. Upload pictures and videos on Instagram and cross-post to Facebook. Expert advice: Timely posts benefit from a higher ranking in people’s News Feeds. What to do if my company only has little money to spend on social media? One of the advantages of Facebook marketing is that it’s adjustable and better able to accommodate budget constraints than traditional media. By aiming your campaign strategically, you can accomplish much better performance than any billboard. Businesses with small marketing means can also use Facebook to boost posts to target their posts to the right audience that will help to extend the reach. 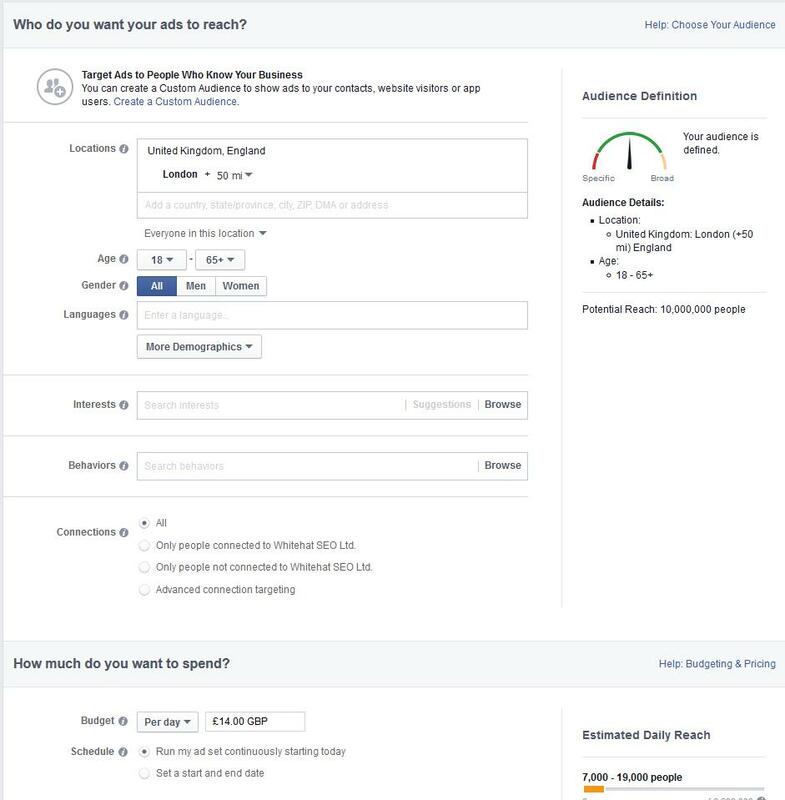 Use Facebook Insights to figure out the demographic details of your audience. The more you know about your audience, the easier the targeting becomes. This data is useful as it gives you insight about content that resonates the most with your audience, and what communication style your audience responds to the best. Try not to focus on making sales on Facebook. The logic behind Facebook changing its algorithm is because an increasing number of businesses are uploading sales-driven content, as opposed to resourceful information that will provide value to their audience. Facebook intends to steer away from this standard, as they would like to make Facebook’s user experience more pleasant. Due to that, if businesses are prompted to alter their Facebook advertising strategy, there will be more valuable information given to their audiences. Post your very best content on Facebook (It will be worth it!). Facebook aims to offer their users only the best content on their News Feed. Which is measured by engagement on their posts, pick content that has been successful on other social media pages or your business’ content marketing platform. Motivate and enable your employees to engage with your Facebook Page. One of the easiest methods to increase your Facebook organic reach is to enable your employees to interact with your Facebook page. Again it is all about the engagement level. The more you can increase your engagement the bigger the Facebook organic reach becomes. And at last of that is as well very important: do not forget to respond to your audience. If you receive a comment, reply to that comment; if you receive a post on your business Page, reply back to that post. Adding the human touch can help your Facebook presence drastically. Don't forget to contact us or fill out the form if you need the best Facebook marketing strategies for your business today.